US stocks are down some today, but nothing alarming, mostly remaining toward multi-month highs. It's possible that we've seen "asset inflation" rather than more traditional inflation on goods and services because wages as a share of GDP are quite low. Short-Term VIX is scraping the bottom of its barrel, and there's reason to expect a broad continuation of this pattern. Spot VIX (VXXB) remains anchored in the 12-range while US stocks (SPY, DIA, QQQ, IWM) hand back some of last Friday's gains. One aspect of negotiating change in the terms of trade between the US and other nations relates to why we're arguably having these discussions in the first place: enforcement. I am not going to bash either China or the US president. 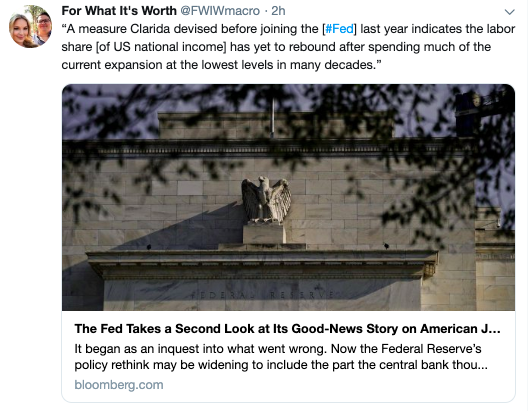 It's worth considering, however, that trade spats have acted as a significant form of market friction over the last eighteen months or so. Evidence exists that the acrimony involved in these discussions has itself resulted in decreased trade. Hopefully trade negotiations can settle out quickly and peacefully, and then both parties can do a reasonable job (nobody's perfect) of hewing to the spirit and terms of the new agreement. Otherwise we may be seeing volatility for vol's own sake. Wages as a share of GDP have been in chronic decline since the 1960s (though they are up some since around 2013). It's possible that we've seen a shift in the nature of inflation, away from goods and services and toward a clamoring for financial assets at any price. Interest rates, cap rates, earnings yields are all significantly lower today than they have been over most of the last 100 years. I view secularly reduced volatility in risk assets as a driver's-seat cause for why asset prices have embarked on this trend toward higher valuations. For the time being, that priority set looks to remain the way of things. If wages as a share of GDP moves higher, then we may see increased potential for traditional inflation to gain a foothold, which in turn may spur higher interest rates, lower valuations, and higher vol. Great observation and musing, BCK. ZIV is pretty much intrinsically less volatile than SVXY, due to its underlying VX contracts living farther back on the curve. 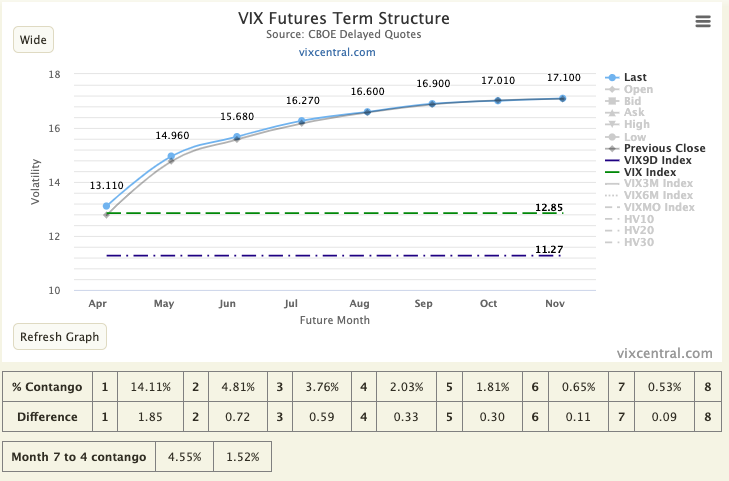 Those contracts are less responsive to moves in the underlying VIX. Risk-return relationships tend to work as predicted only in the long run. The whole point of more risk is more uncertainty. On average the more uncertain outcome is more profitable (let's put aside arguments about beta and correlation for a moment), but that says nothing about what will happen over any particular stretch of time. If SVXY can reap some roll decay here, then I think it's in pretty good shape for earning strong returns over the next couple months; this, naturally, takes the perspective that vol will continue to lie low for the next thirty to sixty days. Regardless of the underlying product, implied vol needs to be rooted in some set of expectations. Those expectations do not need to principally emanate from realized volatility, and in fact sometimes they are not (take for instance single stocks just before earnings announcements). But while the SPX has had a positive drift term over the last month, the realized volatility has been beaten to within an inch of its life (10.62 inches really, if each vol point on the HV20 counts for an inch)! Eighth percentile, folks! VIX9D is scraping the bottom of the barrel. This short-term measure of implied volatility on the SPX tends to be jerkier than the standard 30-day measure (and that's saying something). Matt Thompson brings to the fore that such conditions can persist. In fact, I haven't looked at the data yet, but I'd be pretty willing to bet that these low (and high) percentile values are heavily clustered together. Unlike returns, volatility is highly autocorrelated. The April VX contract technically expires this Wednesday morning, but most traders will be out of the "J" contract by Tuesday's close at the latest. 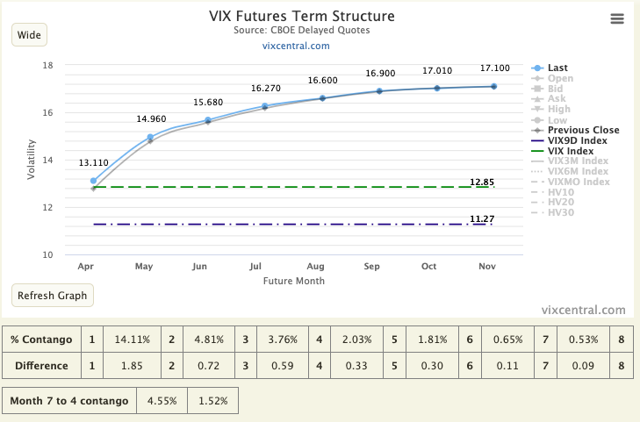 April's proximity to expiration implies that it will act closer in step with the spot VIX. This is particularly true in scenarios such as we presently encounter, where spot isn't moving around a whole lot. Robin has an interesting take on bubble formation: "in which I plan to participate". Bubbles end in heartache for those who are sucked into them, but generally those who lose never really understand that they were in a bubble to begin with. I'd be interested in what changes Robin would make (if any) to his typical style of trade if he were operating under the presumption that he was in fact operating in a "bubblicious" environment. Thank you for reading - now go file those taxes!